The anti-choice movement can be so clumsy, and so weird, we forget that it is also smart and strategic and busy busy busy. Because while you were shaking your head over pink Bibles and stem-cell futurology, Komen was hiring Karen Handel as senior vice president for public policy. Handel is not your typical philanthropy administrator. She is a Republican pol, a former Georgia secretary of state, who ran in the 2010 gubernatorial primary, with endorsements from Sarah Palin, Mitt Romney and anti-immigrant finger-pointing Arizona Governor Jan Brewer. At that time she described herself as “staunchly and unequivocally pro-life,” opposed to stem cell research and a fan of crisis pregnancy centers—places that have repeatedly been shown to use scare tactics and misinformation to dissuade women from seeking abortions. She vowed to eliminate from the state budget pass-through grants to Planned Parenthood for breast and cervical cancer screenings. Interestingly, she had previously supported these grants, using the exact arguments defenders of Komen’s PP grants are making now: PP is the only organization capable of doing the work—reaching low-income women, for whom the PP clinic is often the only medical care the get—and the grant money does not fund abortions. Handel’s turnaround shows you how quickly the anti-choicers have claimed formerly neutral turf: in only a few years a relationship deemed normal and good — in Georgia! — and the only existing way of providing needed services was branded with the mark of the beast. At least this one is funny. 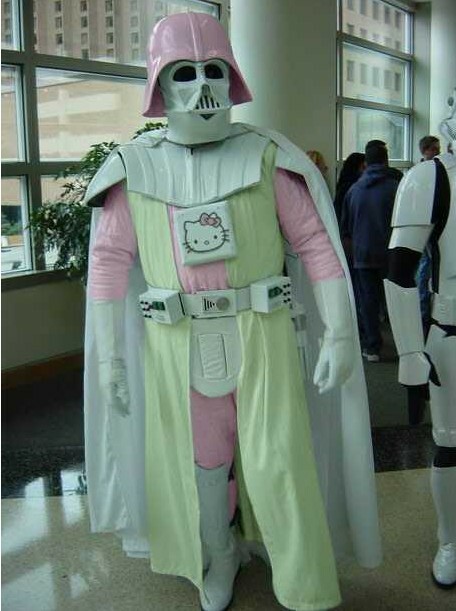 Hello Kitty meets Darth Vader. It's hilarious. I'm starting to believe, until proven otherwise, that the Susan G. Komen enterprises are dangerously close to becoming a right-wing "fog shop" — i.e., a Movement Conservative operation that functions on the surface as a "woman's rights"–friendly do-gooder op, while harboring within it the nasty seed of wicked right-wing intentions. Some Guy With A Website chimes in.